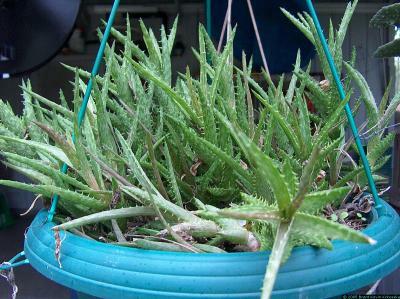 I'm fairly certain that this is an Aloe juvenna, but the form of this one is dependent on the amount of sun it receives. These were grown in almost full shade, which elongates the leaves and stems. In these conditions, it can grow into an incredibly large, trailing plant, great for hanging baskets. In full sun with less water, everything compacts and the leaves take on a slight reddish tinge. The leaves are spaced very closely on the stem, leaving almost no stem visible. In either form, it seems to like water. The only thing I've found it doesn't like is continuously soggy soil.